Anti-suffrage poster. Credit: Plashing Vole/Flickr. One of the ongoing problems feminists face is how to document our own history. The closure of the Women’s Library in 2012, the funding difficulties currently faced by The Feminist Library, the movement’s reliance on short-life publications and the lack of knowledge about digital archiving (how exactly are feminists going to access and study #YesAllWomen in 100 years’ time?) are just some of the difficulties facing contemporary feminist historians. The fact that women’s contribution is often excluded from traditional history books adds another layer of complexity and, as a result, many branches of feminism are overlooked or forgotten. For fairly obvious reasons there has been little enthusiasm for that awkward side of feminist history: women’s opposition to feminism. The emergence of Women Against Feminism in 2014 demonstrated that many feminists struggle to respond to anti-feminists with anything other than exasperation or amusement. What these responses miss, however, is that there is actually a long tradition of anti-feminism, stretching back to the late-18th century. Anti-feminists do not hold an obvious place within feminist history. They are yet to achieve a coup or any significant power grab within the movement, tending to remain as external critics or outliers, but anti-feminism has remained a consistent feature of feminist life. By examining two organised groups of anti-feminists operating over 100 years apart, it becomes clear that we should be wary of under-estimating their legacy. By suggesting that giving women equal rights to men somehow creates an imbalance the WNASL tapped into people’s fear that feminists will never be satisfied. This fear has been repeated throughout the 20th and 21st centuries and can now be seen in posts on Women Against Feminism where anti-feminists hold up signs saying “I don’t need feminism because I believe in equality for everyone, not just women”. The scaremongering tone of the manifesto (England in flames, mentions of revolution and danger) was later adopted by anti-choice groups in the 1960s and 70s. These pressure groups, mainly staffed by women, claimed that access to abortion and contraception was damaging women’s health and could lead to destruction of the family unit. The WNASL manifesto went on to site the campaign for women’s suffrage in North America and claimed, erroneously that: “After forty years it [the American campaign for suffrage] has been practically defeated. The English agitation must be defeated the same way by the steady work and argument of women themselves.” The suggestion that a woman’s real power lies in her ability to defeat other women proved to be very popular within the anti-feminist movement. Returning once again to Women Against Feminism we can see women holding up signs saying they don’t need feminism because they are strong women and feminism just wants to turn everyone into a victim. At the time of its formation that WNASL was seen as move of a nuisance than a threat. 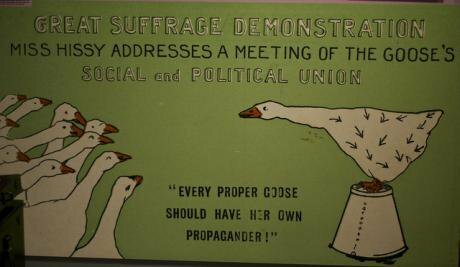 Just as contemporary feminists tend to be amused by anti-feminists, campaigners for women’s suffrage were not especially intimidated by the WNASL. It was easy to make fun of overblown rhetoric from anti-feminists like popular novelist Marie Corelli when she asked: “Shall we make a holocaust of maidens, wives and mothers on the bronze altars of party?” Unfortunately while feminists then and now were amused by sentiments like this we never did work out an effective way to refute them. Or if early feminists did find a way to silence accusations of sacrificing mothers and maidens, it was not recorded. On closer examination there are two recurring themes with organised anti-feminism. The first is a deliberate misrepresentation of what feminism is. A year on from when Women Against Feminism made headlines a number of popular posts in the group make reference to the traditional definition of feminism: “the belief that women should have equal political, social and economic rights to men”. For many feminists this is enough of a response to accusations that feminism believes that women are better than men. But the women on Women Against Feminism are clearly familiar with this view of feminism and have rejected it, choosing to continue to deliberately misrepresent the movement. In retrospect the scaremongering of the WNASL is understandable, they were a political pressure group and, at the time, that kind of language was deemed the most effective for scaring people away from feminism. The reason for the misrepresentation by Women Against Feminism is less cut and dried but it can be linked to the current aims of Western feminism. In 1908 campaigners for Women’s Suffrage were after a change in law, so the WNASL adapted their tactics to stand in opposition to all bills pertaining to women’s suffrage. In the present day the majority of feminist campaigns are focusing on changing the way people respond to and think about women, including body policing and acceptance, issues around consent and issues of equal pay that aren’t obviously solvable by a change in the law. Feminists are less interested in changing the law and more interested in changing people’s behaviour, and Women Against Feminism’s emphasis on women’s personal choices (“feminists judge me for being a stay at home mum, but it’s my choice”) demonstrate that they are well aware of this shift in focus. The second link between the tactics of the WNASL and Woman Against Feminism is that they represent the views of fairly privileged women. WNASL members were wealthy women who usually had platforms of their own, either through the right-wing press or high-profile husbands and fathers. On the surface anti-feminist sentiment appears to come from a position of unexamined privilege but, just like their forerunners in the WNASL, today’s anti-feminists have good reason to maintain the status quo. As Laurie Penny points out: the women featured on Women Against Feminism hold a great deal of cultural currency in areas that feminists traditionally try to subvert. As intersectional feminism becomes more popular it is, sadly, to be expected that some white, straight, cis first world women will see the emphasis on their own privilege as an attack. In a similar way feminist calls for a more inclusive beauty standard and appreciation of multiple body types can be read as an attempt to undermine the received wisdom that ‘skinny white girl’ is the ideal aesthetic. In contrast to feminism, anti-feminism has achieved very little. Both WNASL and Women Against Feminism failed to stem the public support for feminist aims, their influence is relatively minor and their arguments are easy to dismiss. The very fact that women opposing feminism continue to organise and agitate, however, suggests that anti-feminism deserves closer examination. Anti-feminism is part of our legacy and it would be a shame to let this slightly odd, slightly sinister side of the movement disappear.